It should be obvious that it is impossible to determine the size of the Internet. However, in the day and age in which we live, if you cannot impress someone with numbers, that someone will usually be unimpressed. Therefore we have to measure the size of the Internet. One of the best surveys of the size of the Internet is conducted bi-annually by the Internet Systems Consortium (isc.org). At least their method is clear and they are aware of the limitations of the method. To see the latest size of the Internet (as well as a host of other interesting statistics) consult their site. Our museum's interest in their numbers is more local. 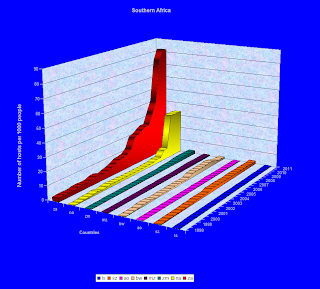 The graph below depicts the growth in the size of the Internet in Southern Africa (excluding South Africa) between 1997 and 2012. The growth in some countries (Namibia - yellow, Zimbabwe - green and Mozambique - purple) is impressive. Or, at least, it was impressive until the worldwide economic downturn started. Unfortunately the impressive growth in these countries pales when the growth in the regional superpower, South Africa, is added to the picture. The graph below shows the growth in South Africa in red. Relative to South Africa the best performer in the previous graph, Namibia (in yellow), shows hardly any growth at all. Of course, anyone who has ever travelled through the beautiful Namib knows that people are scarce in that vast country. In a sense it is 'unfair' to plot Namibia next to South Africa. The graph below 'corrects' this by plotting the number of hosts per thousand inhabitants for each country. 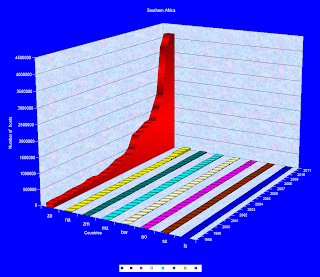 (The population sizes are from the WHO site - interpolated and extrapolated where necessary.) This shows that Namibia now becomes visible next to South Africa. However, the other Southern African countries still have hardly any presence on the Net compared to South Africa and Namibia. 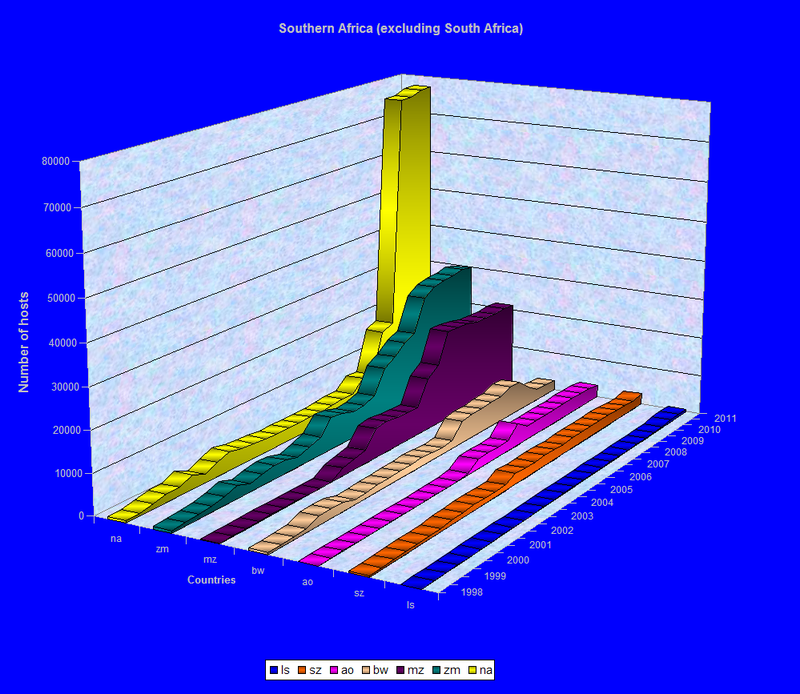 In the global context even the overwhelming regional growth in Internet size in South Africa pales. 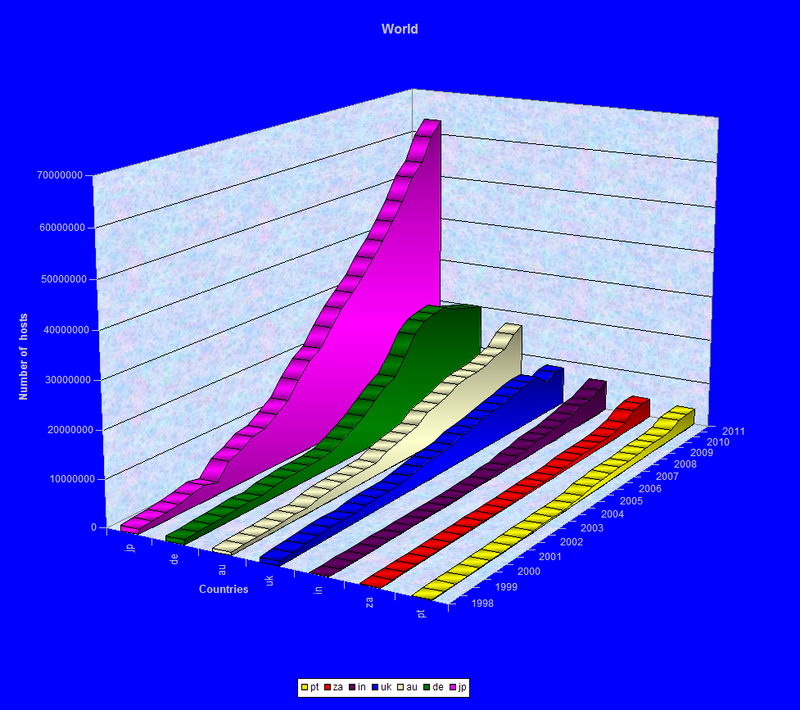 The graph below shows Japan (in pink), Germany (in green), Australia (in beige) and a couple of other countries. South Africa is shown in red - almost a flat line next to countries elsewhere in the world. Note that the country plotted in yellow in this graph (next to South Africa) is Portugal. Before concluding that South Africa is on the wrong side of the digital divide it should be noted that the .za TLD ranks 23rd on the list of 270 TLDs measured in the January 2012 survey. Lesotho is at position 189. We leave it to the reader to consider the location(s) of the global digital divide(s).